An other awesome feature of Winamp (actually a plugin) is "Jump to file". If you type "j" in the playlist editor, or ctrl-alt-j from anywhere else (with global hoteys), you get a box performing search in the current playlist (playlist search). 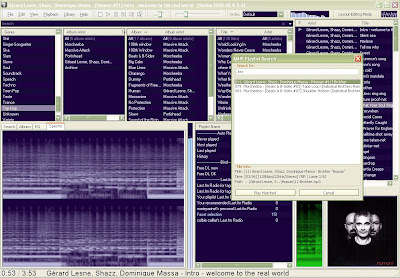 It's very easily accessible in foobar2000. You will get this playlist-search box, which does pretty much the same thing as "Jump to". Double click on a track, it will jump to it. You can associate a hotkey for this in Menu>Preferences, General/Keybord Shortcuts (cf dedicated post for more details). To find the action, filter with "edit search". NB: You can make a global hotkey. However, if you are in another application and call the playlist search, the search window will not popup over your current application, and you will have to focus to foobar2000 to use it. It is possible to have a similar search box that popups on the top of your current application with the following method. 2. Close foobar2000, then unzip and execute the exe files to install the stuff. 4. It's ready to work. 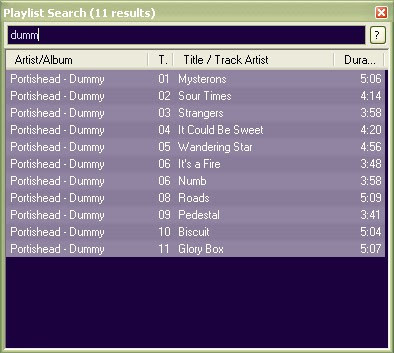 There are less options than in Winamp (notably "Move after current"), but, I think it does the job.